Apr. 1 Update: Tickets for both the BITW PPV and the day-after TV taping went on-sale today. 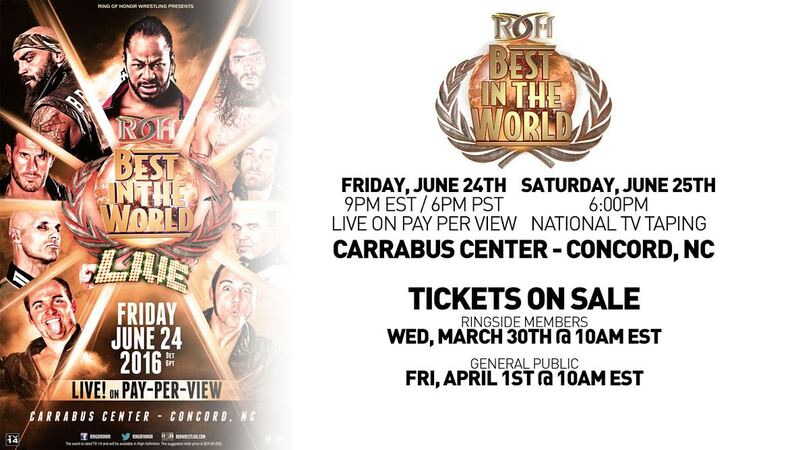 Best in the World takes place on June 24 in the Charlotte market (Concord, N.C. at Cabarrus Arena). ROH then holds a post-PPV TV taping on June 25 in the same arena. Ring of Honor announced that “Best in the World 2016” will take place on Friday, June 24 and air on traditional PPV. The event will take place in the Charlotte market at Cabarrus Arena in Concord, N.C.
Tickets for the PPV live event go on-sale this Friday, April 1. Ringside members get early access on Wednesday. BITW 2016 will follow ROH’s “Global Wars” PPV on May 8 in Chicago, accelerating the pace of traditional PPVs.